Every flooring type comes with its own set of pros and cons. At the end of the day, the right flooring option will provide a homeowner with a surface that is practical, within their budget and in line with their personal tastes. In order to decide if concrete may be the right choice, it’s important to first understand what it has to offer and be prepared for the associated cost and installation procedures. Historically, concrete flooring has been relegated to basements and industrial spaces. But this convention has shifted over the years as designers and taste makers have moved toward a shabby-chic aesthetic. Where concrete used to be viewed as sterile and drab, it is now being hailed as practical and durable. Modern installation techniques have also increased concrete’s versatility and ability to appear stylish. Concrete floor installation usually requires professional expertise. Although it is possible to pour a concrete floor without professional assistance, it isn’t recommended. Due to the permanent nature of concrete, and the difficulty of modification once the pour has set, a professional contractor really ought to be considered. 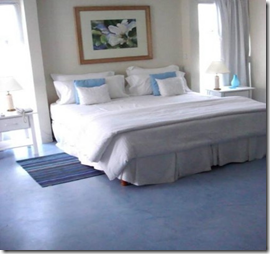 A concrete floor can cost anywhere from a few hundred dollars to a few thousand or more. Like all other flooring types, cost is based on the size of the floor that needs to be built. Cost will increase if additional services are requested. It’s recommended that a sealant is applied to concrete floors. Because concrete floors are porous, they will absorb and show stains unless a sealant is used to cover pores. Although sealant application results in more upfront cost, it will do much to preserve the floor’s appearance. Concrete floor installation will also become more expensive if a homeowner opts for a color treatment with dyes, stenciling, a metallic coating or other stylish procedures. 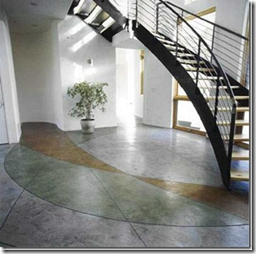 There are many benefits to concrete flooring. For one thing, it’s virtually indestructible. It will stay cool during the hot summer months, and thus help to keep a house cool as well. Concrete floors don’t require very much maintenance. Other than occasional cleaning with a mop, a concrete floor will need to be re-sealed every year or so. Despite old-fashioned ideas to the contrary, concrete floors can actually be quite stylish. A wide range of treatment options can yield colorful and personalized results, albeit for an increase in price. Still, a personalized concrete floor can really define a room. Concrete is very hard. Because of this, the risk of injury when falling on concrete is greater than that encountered with most other flooring types. For this reason, concrete flooring is not recommended in houses with elderly residents. Additionally, concrete’s coolness is great until the weather gets cold. While a pro during the warm months, this coolness factor becomes a con when it’s chilly. Moisture may also become an issue in humid locations. If a concrete floor isn’t sealed, moisture may find its way up through the concrete’s porous structure. This can result in mildew or water damage to a home. Justin runs a small hardwood and laminate shop, Flooring HQ Store. He loves to share his knowledge on all of the different flooring and home improvement options available on the market today.